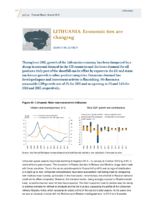 Throughout 2015, growth of the Lithuanian economy has been dampened by a slump in external demand in the CIS countries and the lower demand for oil products. Only part of the shortfall can be offset by exports to the EU and Asian markets or growth in other product categories. Consumer demand has developed apace and investment activity is flourishing. We forecast a reasonable GDP growth rate of 2% for 2015 and an upswing to 3% and 3.4% for 2016 and 2017, respectively.